Easy Breather Side Sleeper Pillow - Made for Your Sleep Position? Some of you sleepers might already be familiar with the Easy Breather pillow line from Nest Bedding. It includes a variety of contoured pillows, pillows made of foam and latex, and even one designed for children. Well, now we can add a new one to the list! The Side Sleeper adjustable pillow has joined the Easy Breather family, and I’m ready to see what it’s all about. 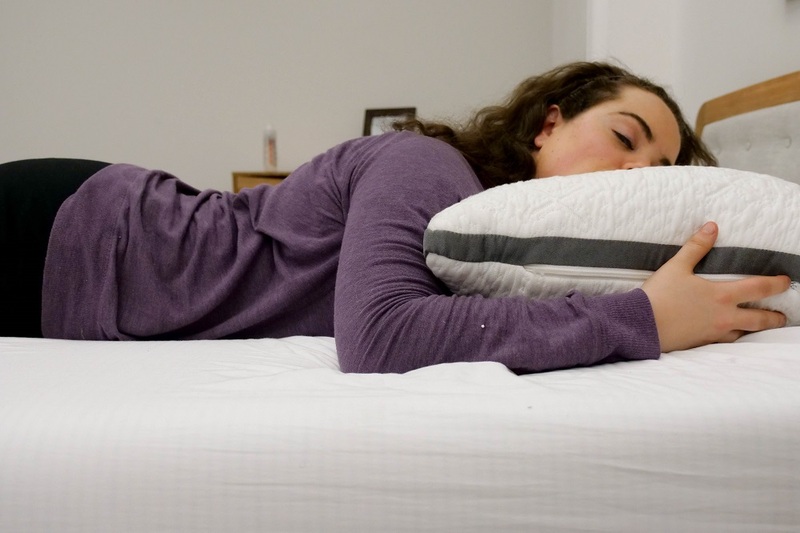 In this pillow review, I’m going to find out what makes this such a great pillow for side sleepers, and determine if any other sleepers can benefit from its unique design! If you don’t have time to read the full review, click here to skip to the review summary. The cover of the Easy Breather Side Sleeper is made from a luxuriously soft fabric called Tencel, and has a thin grey strip of polyester that outlines the pillow’s shape. Tencel is similar to cotton but has a silky softness to it as well as sweat-wicking and cooling properties. This pillow is 8 inches tall and stuffed full of shredded memory foam, a material known for its moldability and slow response to pressure. On one side of the pillow, there is a zipper that allows easy access into the pillow’s fill so sleepers can reach in and adjust the loft to their liking. The nature of shredded memory foam is to softly contour the sleeper’s head and neck while providing that deep sink into the pillow that is characteristic of solid memory foam. Unlike solid memory foam (which has a tendency to trap body heat), the popcorn sized shreds of memory foam enhance the flow of air through the material making the pillow nice and breathable. The pillow is shaped sort of like a boomerang; the sides are thick, the middle is thinner, and it curves in the center. This design is intended to ensure that folks who sleep in the lateral position are able to maintain healthy posture throughout the night. Side sleepers can roll back and forth and always be met with a lofty cushion of memory foam to support their necks. The softer middle area eases the sleeper’s transition from side to side, offering an even place to roll in between lateral positions — but it also provides great support for back sleepers. This pillow may be called the Side Sleeper, but back sleepers could definitely benefit from the flat, cushiony comfort of the middle area. BUT WHAT DOES IT FEEL LIKE? The Easy Breather Side Sleeper is full of shredded memory foam which means your head is going to comfortably sink into the pillow. Folks familiar with Nest Bedding’s Easy Breather memory foam pillow might already know that the nature of shredded memory foam is to conform to pressure in a way that provides support unique to your shape. 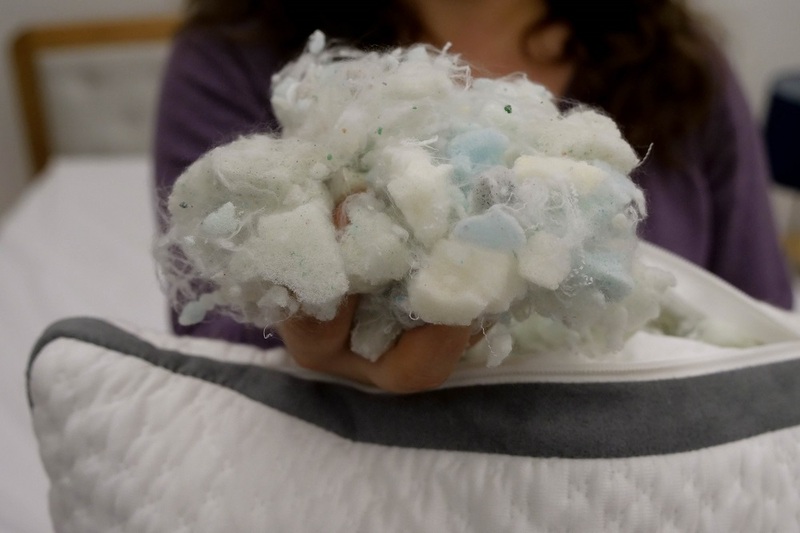 For sleepers who are less experienced with shredded memory foam, you should know that shredding the material provides quite a different feel from traditional memory foam (which typically comes in one solid piece). Unlike traditional memory foam, the Easy Breather Side Sleeper’s shredded fill makes this pillow a bit more malleable and easy to sculpt. Not to mention, this particular pillow is adjustable. 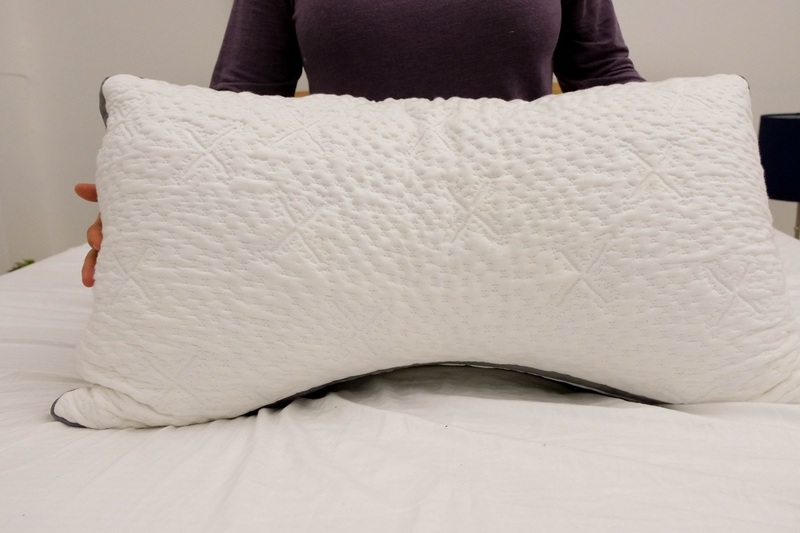 So, if you can’t manage to sculpt your pillow into the shape that best suits your sleep style, you can always open it up and play around with the fill until you find your fit. Something I prefer about shredded memory foam is that it doesn’t trap heat like a solid block of memory foam can! The individual pieces of foam move independently which increases airflow and breathability through the pillow. Combine that with the temperature regulating properties of Tencel, and you’ve got yourself a cool pillow. More: Making your sleep space cool for the Summer? Check out our guide to the best cooling sheets! This is definitely a soft, lush pillow and some might feel that it is a bit less supportive than traditional memory foam. 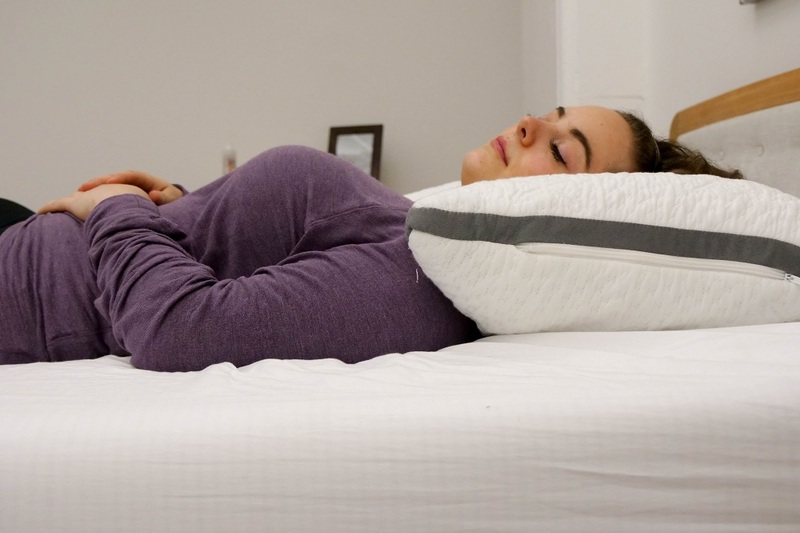 I encourage sleepers who buy the Easy Breather Side Sleeper to be patient with this pillow; give yourself some time to let the pillow become familiar with your body. This is not a ‘one-size-fits-all’ pillow, and sleepers who spend a little time adjusting the fill to meet their preferences will probably benefit the most from its special qualities. The Easy Breather Side Sleeper offers two sides with higher loft and one middle area that’s a bit thinner and softer. 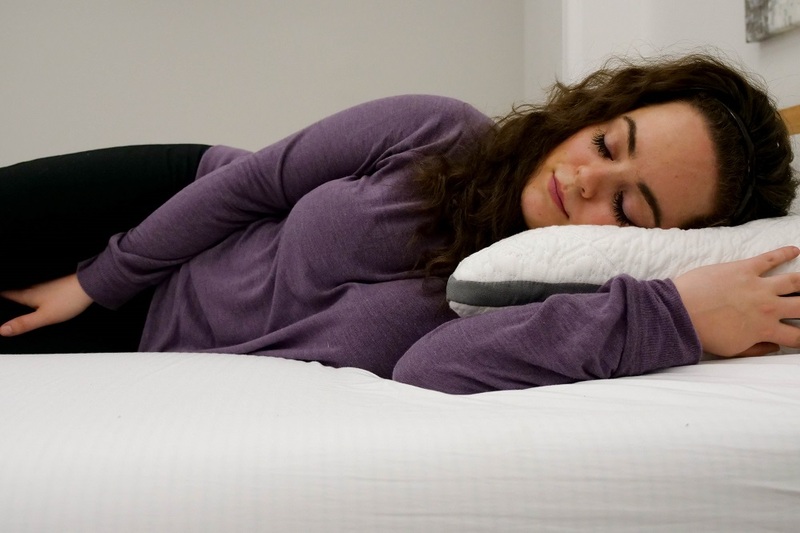 As the pillow’s name denotes, it was designed this way to benefit side sleepers…but how? Well, when you’re in the lateral position, your posture is elevated because you’re propped up by your hip and shoulder. Because of this, your head will fall to the side without the appropriate level of support under you. Side sleeping can be tricky, because without that perfect balance of support under your head and neck, your spine will be forced out of neutral alignment causing some serious neck strain. With the Easy Breather Side Sleeper, however, the extra loft of the pillow’s sides ensures full support under your head so that your neck stays comfortably aligned in its happy place. Now you might be thinking: “But what if they make the loft too high and my neck is forced out of alignment anyway? !” Fear not, sleepers — that’s what the zipper is for. If you find the height of the pillow’s sides to be too tall, simply open the pillow up and remove/manipulate the fill however you like. There is no limit to how much foam you can remove or move to other areas of the pillow; sleepers should feel free to make this pillow their own! More: Looking to step up your pillow game, but not sure where to start? 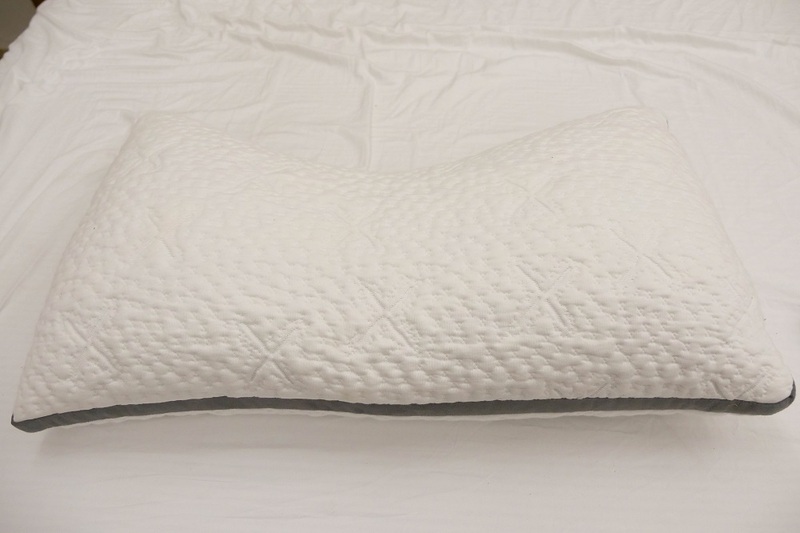 Check out our list of pillow reviews and ratings! As some of you may already know, I’m a back and side sleeper. I have been dabbling in the land of stomach sleeping lately, but my sleep pattern usually involves a whole lot of back and side action. So, using this pillow came really naturally to me. When preparing for sleep, I typically start out on my back and roll onto my side during the course of the night; but this pillow is called the side sleeper, so I had to test it in the lateral position right away. When I first rested my head on one of the pillow’s lofty sides, my initial reaction was that it was a little too high for me. So, I unzipped the pillow, reached in and moved some of the side’s filling into the middle section for a slightly more even distribution. I’m rather short, so I kind of anticipated some initial adjustment would be necessary. Once I fixed the pillow to my liking, I zipped it up and tried again. Ahh, yes, now we’re talkin’. The newly adjusted loft supported my head just enough to keep my neck in healthy alignment with my spine, and my shoulder feeling supported as well. The luxuriously soft feel of the Tencel cover fabric felt comforting and cool against my cheek, and the memory foam gently conformed to the pressure of my head. Something I love about shredded memory foam is that it gives you that engulfed feeling that traditional memory foam provides, but you can still fluff and shape it a bit to make it more personal to you. After feeling the cushiony support offered in the lateral position, I had a sneaking suspicion that this pillow might be great for back sleeping as well (and I was right). Because the pillow’s shape is sort of curved and thinner in the middle, I rolled onto my back with considerable ease. The shorter, softer area of the middle allowed me to keep good supine posture and also be able to rest my temple on the cushy sides. After lying on my back for a little while, I rolled onto my other side and the transition was notably smooth. The way this pillow is curved and filled is really conducive to combo sleepers who roll from back to side and back again. So, back sleepers, while you might not be in the title, this is a good pillow for you too! Just to be thorough, I tested the Side Sleeper between my legs and on my stomach even though I got the sense I wouldn’t love this pillow for those styles. I was surprised to find that after removing a considerable amount of filling, this pillow had good prone position potential! I felt a little guilty taking all of that lovely, fluffy memory foam out of the game, but creating a softer, thinner surface allowed me to rest comfortably on my stomach without straining my neck. My least favorite use for this pillow was in between my legs. My top leg just sort of sunk into the memory foam and I wasn’t getting that bouncy, resilient support that I need for a pillow in this position. My hips didn’t feel balanced and the shape is also not ideal for holding. I didn’t feel strained or anything, just not very comfortable. Overall, I think this is a solid pillow choice for back and combo sleepers, but this pillow is definitely most beneficial to side sleepers. The way the pillow’s shape contours to your head, neck and shoulders while providing that extra lofty support on the sides is really just a great design for sleeping in the lateral position. That New Memory Foam Smell — It is not uncommon for new memory foam products to have a bit of a chemical smell to them at first, but don’t worry! It’s non-toxic and goes away after a few nights. Not Machine Washable — Never put this pillow in the washing machine! It must be spot cleaned with a damp (preferably white) cloth using cold water and a mild detergent. Then, let it air dry. 100 Day Trial — If this pillow isn’t for you, you have 100 full days to send it on back for a full refund. How’s that for pressure relief? HEY, I’M A SIDE SLEEPER! SHOULD I TRY THIS PILLOW? Is pregnant — If you’re pregnant, you already know that your body reaches a point where side sleeping is pretty much your only option. 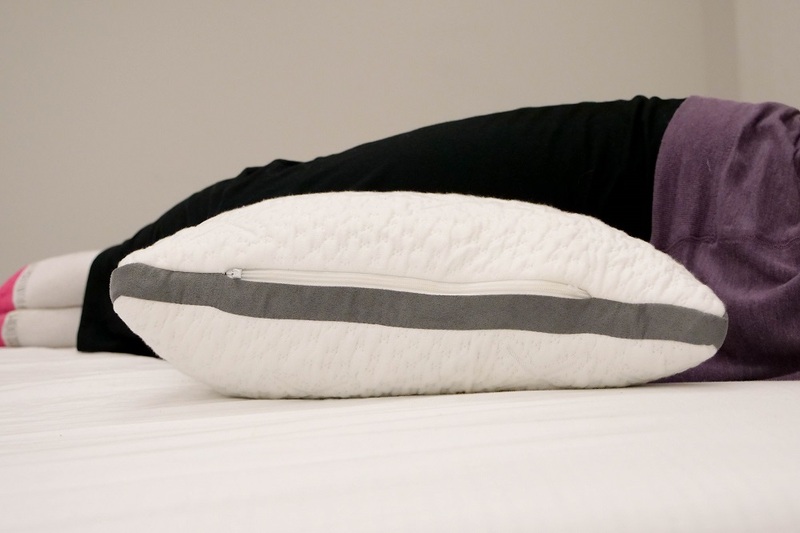 This pillow can help keep you comfortably supported in the lateral position all night long. Alternates between back and side — If you’re a combo sleeper who rolls between side and back positions, this pillow has great support for both. Use the sides with higher loft when you’re on your side, and use the thinner middle area for back sleeping. Loves the sink — Unlike down or polyester, shredded memory foam offers that nice sink into to pillow for a feeling of deep, enveloping support. 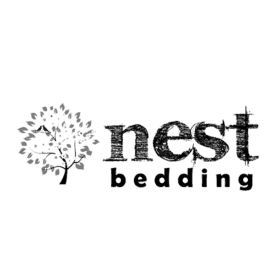 Head over to Nest to buy your Easy Breather Side Sleeper!